Digi-Tally, Inc. designs and produces advanced measurement tools for the energy industry to provide more accurate, reliable, and cost effective field measurement methods. Our company was started based on a need. Our founder realized a need for better semi-automated pipe tally methods to replace a manual tally tape. Current alternatives did not satisfy his needs. The first Digi-Tally system was the result of this quest. Our products have undergone many revisions and have evolved into a rugged user friendly unit with advanced reporting features that tally crews have come to like. 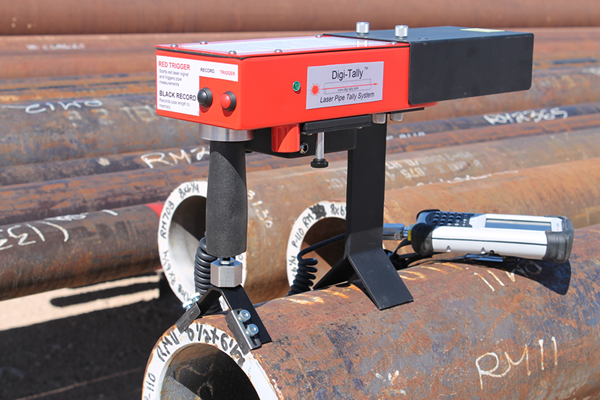 We currently offer the Digi-Tally Laser Pipe Tally System for tallying oil casing and drill pipe in the field at the job site, in a pipe yard, or in manufacturing facilities. The laser tally system provides a complete battery operated mobile field pipe tally system. The length of each pipe joint is measured using an advanced class II eye safe laser and the data is processed on a mobile field controller. Digi-tally, Inc. is committed to advancing the state of measurement at the drill site and in the pipe yards. Look for more advancements and offerings for the oil and gas industry. Digi-tally maintains its USA offices in the states of Texas and Pennsylvania, with its corporate headquarters located in Midland, Texas. ©2019 Digi-Tally, Inc. All Rights Reserved.